Once again, it’s the highest award awarded to the Diema’s Dream Fund’s annual report – we have got a new certificate “Gold standard”! 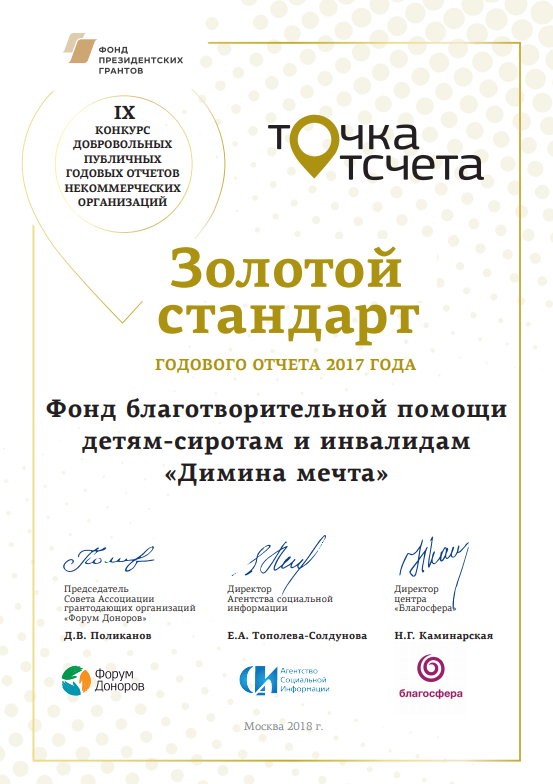 For the fifth time we took part in the contest of annual reports “Reference point” and we received 4 gold certificates and one silver. The last 4 reports were made in the program “Word”, we do not involve designers and do not spend a lot of time on preparation, and we worry every time. And here is a gold certificate again. This is very gratifying because so many of our partners and benefactors work at a very high level. It is especially pleasant when every year our report is cited, set as an example and it is a reference point for many funds. Winning such a competition is also an occasion for us to thank you for your support!